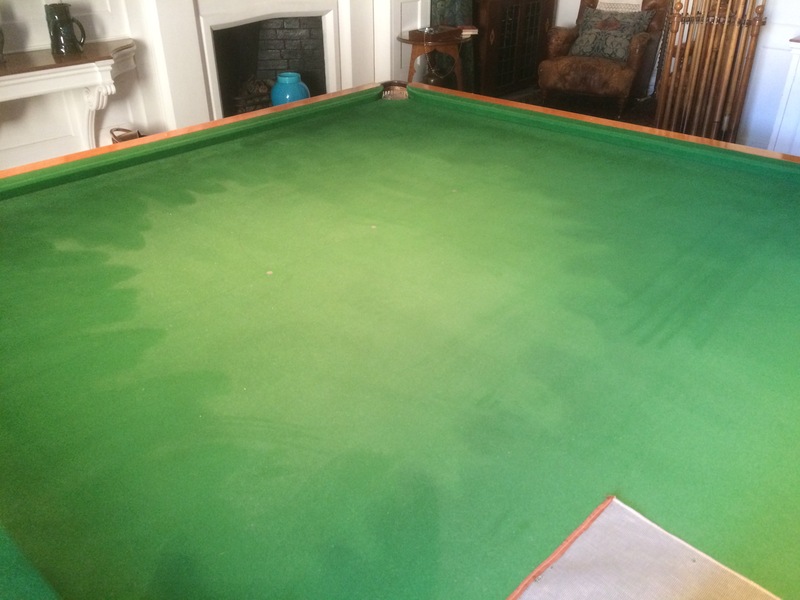 One of the monthly jobs that we carry out is to dust the Billiards table. The dust is quite deceptive (hence the title) in that the table often looks okay after a month until we move the balls and cues! Usually, all of the flat surfaces in the house will be dusted with a chamois every day so that the dust does not stick and cause problems. Dust mostly consists of lightweight organic materials like skin and clothing fibers along with carbon based products like soot and silica. If dust is left too long, the dust starts to bind itself to the surface causing a greenish grayish hue to appear on objects. This dust takes a lot of effort to remove and as such could damage the object. One example of this would be if there was a layer of dust embedded on a gilded picture frame – removing the dust could potential take any gilding off with it and just leave a bare wooden frame. So by dusting everyday and by deep cleaning every object once a year we hope to prevent this happening. We then place a square piece of mesh onto the edge and run a dirt devil vacuum lightly over the mesh. 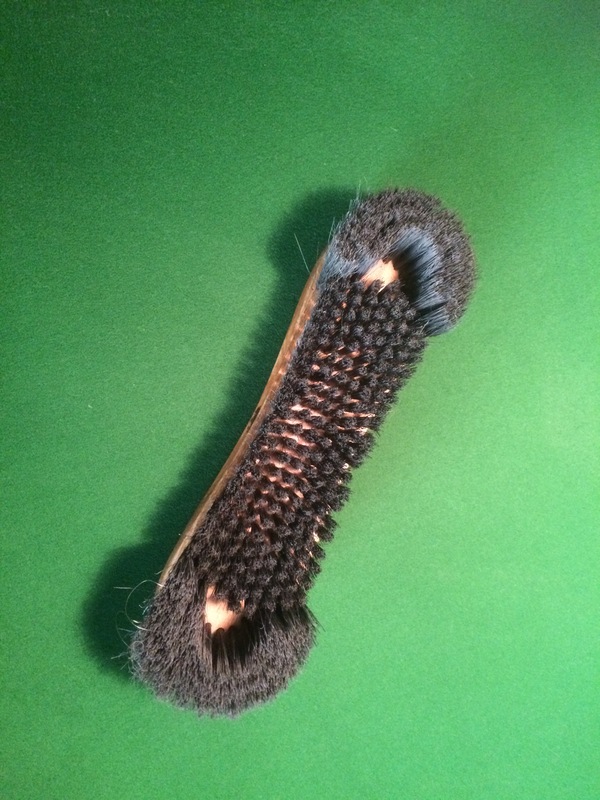 We use the mesh so that any loose baize or threads are not sucked in, avoiding any potential for damaging the baize. The mesh square is about 30cm by 30cm so this task can take some time. Once the whole table has been vacuumed, we check the table manually, picking up any larger bits of fluff or dirt that was not picked up by the dirt devil. 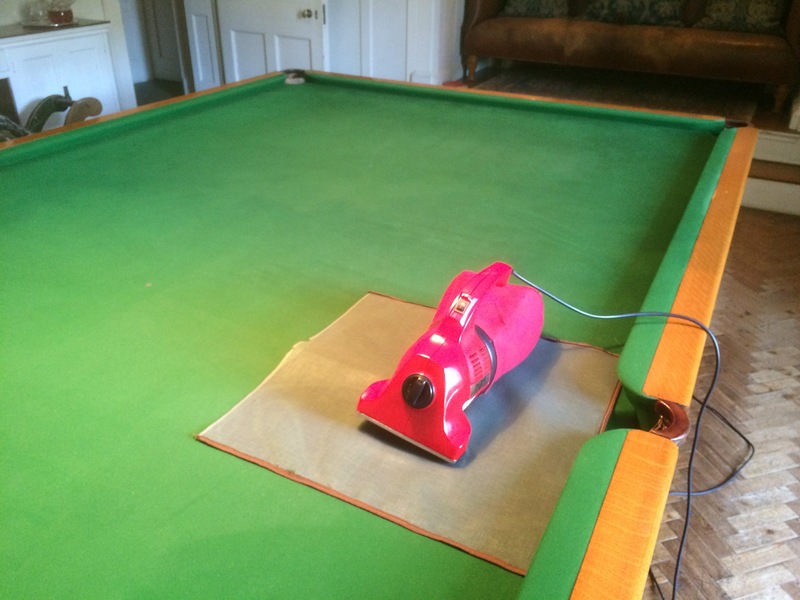 Once the baize has been cleaned, we run a chamois over the polished wooden edging of the table to give it a little bit of a shine. It is always a satisfying job to do seeing the table all nice and dust free (although it never remains that way for long!). 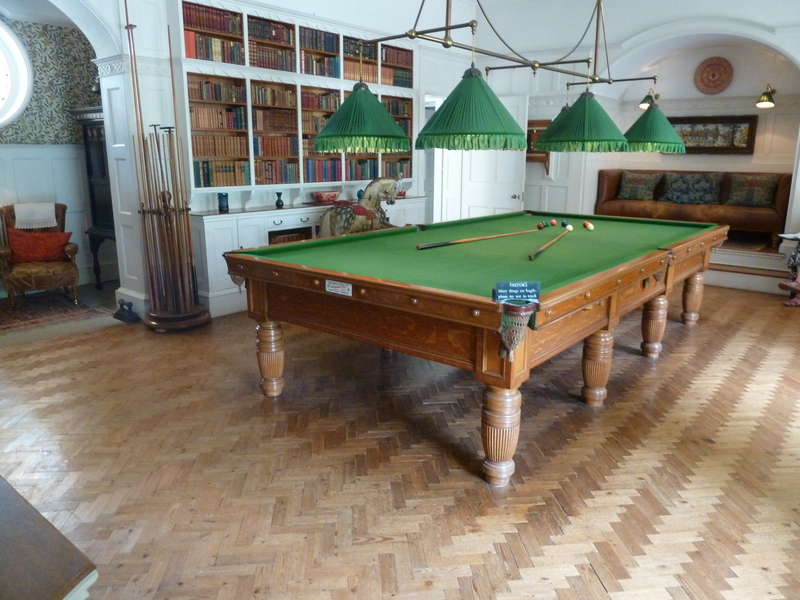 Categories: Uncategorized | Tags: Arts & Crafts, Beale, Billiard Room, Billiards Table, Brush, cleaning, conservation, deep clean, Dirt Devil, Dust, House Team, Mesh, National Trust, object, Standen, Table | Permalink. These Burmantofts vases found in the Billiard Room and in Maggie’s studio were bought to Standen by Arthur Grogan, the first caretaker of Standen after Helen Beale’s death. 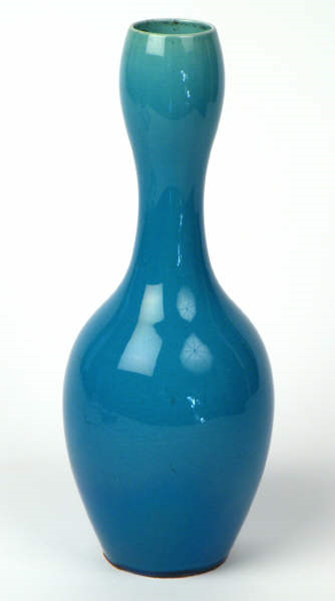 Burmantofts vases as they are known today were only known under this name for a short time during the company’s 99 year stint as a working pottery. The original company was set up in Burmantoft, Leeds by John Lassey and William Wilcox in 1845. They originally started a coal mine but when they hit clay in 1858, started producing assorted building materials, like bricks. And pipes. By the time that 1879 rolled around neither of the original founders were alive and the company had passed onto James Holroyd. He started producing decorative items like vases and jardinières in the 1880s. This move into ceramics bought more fortune to the company enabling them to open a London showroom under the name of the Burmantofts Company. However, this was short lived, soon after Burmantofts merged with five other Leeds based ceramic companies and became the Leeds Fireclay Company. Production finally stopped in 1957. Categories: Uncategorized | Tags: Arts & Crafts, Beale, Billiard Room, Burmantofts, ceramics, collection, Interpretation, Leeds, object, Objects in Focus, Pottery, Showroom, Standen | Permalink. One of the jobs that we carry out every year is to wax the wooden floors and the clay tiles. This is one of those un-glamorous jobs that usually involves people getting covered in wax (Well me at least!). In the past, wooden floors were kept clean by washing them with diluted lime or lime water and then rubbed with sand to keep them shiny. By the time the Beales had built their house, the fashion was to wax them. In order to protect them now, we use a combination of methods. The first is that we vacuum the floors every morning before we open and look out for any broken or damaged pieces of wood or tile. 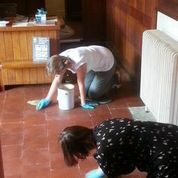 Another way that we use to protect the flooring is druggets under the carpets. A drugget is long piece of canvas, carpet or matting laid underneath the carpet to protect the floor from staining and general wear and tear as well as providing a non slip base. Waxing the floor provides a coating that wears away under people’s feet so that the floor does not get worn, which is why we replace it periodically. The wax that we use on wooden floors is called Harrell’s and is used by the National Trust across the country as it has been specially formulated for historic flooring. It is a dark honey colored wax that we rub into the floor using cloths. We apply it following the grain of the wood and apply it liberally. We only use it on the exposed pieces of flooring as the flooring under the carpets and furniture retains its wax for a long time. Although we wax annually, it sometimes feels as if the floor is drinking it in like water! The wax takes over 4 hours to dry so we leave it overnight. The next day we buff it with a floor polisher machine, that takes quite a lot guidance to keep it going in the right direction! If it is only a small part of the floor, such as the edges around the carpet in the morning room, then we hand buff it using a clean dust cloth. Categories: Uncategorized | Tags: Arts & Crafts, Beale, Billiard Room, Carpet, cleaning, conservation, Historic house, House, House Team, National Trust, Standen, Wax | Permalink.